Aaron, one of their Body Fit Coaches set the tone of the Games with a hilarious (and creative) hip-hop dance warm up. I’m pretty sure I saw him Bernie-ing at one point. Awesome. Looking around the room at 40+ people of all ages getting down to “Wobble Baby” definitely lightened the mood. It was obvious everyone was there to work hard and to have fun. We had spectators, a DJ, and Fitness Manager, Tanya doubled as the announcer. Love it, such a great mood and environment to kick things off. Teams were formed with a Body Fit Coach captaining each team. One group (the champs defending their title) dressed in matching Minions shirts and coordinating socks, other groups in matching neon colors and headbands. And then there was my team, we were called “The Misfits” mainly because we were a last minute team and clearly didn’t prepare like some of the others teams we were competing with. But that’s okay; we were equally welcomed into the Games, we just didn’t look as cool. We had 6 plyometric stations, 90 seconds at each station. I never realized how hard 90 seconds of bodyweight squats were when you were literally doing as many as you could, as fast as you could. Easier said than done. I was really impressed by the diverse group, all ages, all sizes, and all athletic abilities. What was even more inspiring was how everyone’s attitudes were so positive and encouraging towards each other. Even after 90 seconds of non-stop burpees. It was really nice hearing the counters encouraging their teammates to reach certain goals, or to “Just get 10 more,” or “5 more seconds, let’s try to get 3 more in!” Courtney and Lauren, two very sweet longtime team members (whom I’ve known for almost 2 years now just from my frequenting the gym) bustled around collecting scores and tallying points for Tanya at the end. All the trainers and staff were great; you can tell they really enjoy holding these events. The team mentality and the dedication of Body-Fitters is encouraging. It’s obvious that these trainers have had a very positive impact on the individuals on their team from training them over the months leading up to the event. It’s nice to see people so motivated to push themselves for fitness. They’re competing with themselves just as much as they are competing with the other teams. I could see the satisfaction on their faces when they relayed their scores to Lauren. They were proud of their hard work and the points they’d earned for their team. After the team competitions, it was the trainers’ turn to put some points on the board. They compete amongst themselves for the coveted team bonus points for the highest scoring trainer. As you can imagine, the trainers get very competitive, since they’re going head to head with their co-workers. Bragging rights is important… it also makes this portion of the Body Fit Games very amusing to watch. One of the trainers had a hurt arm, so she competed using only one arm, including push-ups. So, it’s a full team effort, everyone gave their all and had a great time. At the end, points were calculated and prizes were awarded to the top male, top female and top team. 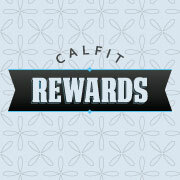 Not only that, but everybody left with a swag bag filled with supplement samples and Cal Fit goodies. Kudos to the Arden Cal Fit, it’s obvious you guys work well together and enjoy what you do to put together such a great event!